The Invicta Dynamos number 20 is back after 22 year old Scotsman Adam McNicoll returned to the club following a change in circumstances that have allowed him to return South of the border and link-up with his former teammates. 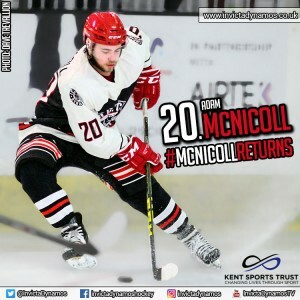 With two and a half seasons under his belt in Kent before now, utility man Adam McNicoll is already a familiar face at the SilverBlades and accustomed to the NIHL South’s top tier. The Dundee man first arrived in Gillingham in the summer of 2013 but, despite a string of promising appearances, the young forward then returned north of the border and finished the campaign back in his home town. His absence was far from permanent however and McNicoll was with the Mos again for 2014/15 and 2015/16. His two stints meant that, before a summer switch back to Scotland following the end of last season, the skater parted ways with the Dynamos having made 102 appearances, notched 21 goals and tallied 26 assists for a total of 47 points. Since leaving the Mos Adam McNicoll signed briefly for the Solway Sharks before later switching to the Aberdeen Lynx. It is Kent that has become his home from home though and the utility man, who has represented the Dynamos both as a forward and in defence, expressed an interest in a return to the club following a change of circumstances allowing him to return south. Head Coach Kevin Parrish has moved quickly to complete the deal and, pending acceptance of his registration, McNicoll should return to the line-up this weekend as the Mos face Streatham and Milton Keynes. 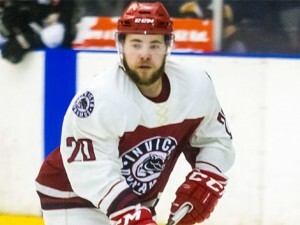 Speaking on the re-signing of Adam McNicoll, Head Coach Kevin Parrish said, “In the early season we’ve already been unfortunate enough to pick up a couple of injuries so to have Adam knocking on the door to make a return is ideal. Adam is an established player at this level, he can do a job for us at both ends of the ice and he already knows the club inside and out. I know he has previously enjoyed his hockey here and he was very keen to return when it became possible so I’m sure the supporters will be delighted to have him back in the line-up. Adam is still only 22, has plenty more to offer out on the ice and I’ve no doubt we’ll see the best of him in 2016/17”. Adam McNicoll’s return comes at a time when captain Callum Fowler and fellow forward Steve Osman are both battling injuries and his re-signing pushes the team’s roster to 22. Should his registration be processed the Scotsman should feature as the Dynamos travel to Streatham to face the newly named Redhawks on Saturday before the team return home for a SilverBlades date with the Milton Keynes Thunder on Sunday. Doors open at 4.30pm for the clash with faceoff at 5.15pm. Warm-up Jersey – For just £125 get your name or logo printed on the back of Adam McNicoll’s warm-up jerseys. Sponsors are then presented with the jersey to keep at the end of the season. Game jerseys – Get your name or logo on the back of Adam McNicoll’s game jerseys and become a part of the action.